Investigators know who pulled the trigger but still have not determined who ordered the killing of journalist Anna Politkovskaya, the chief investigator said in an interview published Monday. Politkovskaya, whose persistent reporting of atrocities against civilians in Chechnya had angered the Kremlin but won her international acclaim, was gunned down in the entryway of her Moscow apartment building on Oct. 7, 2006. The first anniversary of her death has brought new attention to attempts to find her killers. Petros Garibyan, the lead investigator in the case, said the murder was political and may have parallels to the 2004 killing of Paul Klebnikov, the U.S.-born editor of Forbes magazine's Russian edition. Charges have been filed against 11 people, 10 of whom have been arrested, Garibyan said. He said investigators have identified the gunman but have not yet filed charges against him. "We haven't charged the killer yet, but we know who he is," he said in the interview published in Politkovskaya's newspaper, Novaya Gazeta. Those arrested were accused of helping organize the murder, but the investigators had not yet determined who ordered it, said Garibyan, senior investigator with the Prosecutor General's office. He refused to speculate on who might have been behind the killing, which occurred on President Vladimir Putin's birthday. His boss, Prosecutor General Yuri Chaika, said in August that the hit on Politkovskaya was ordered by someone living outside the country with the aim of discrediting Putin. The statement was interpreted as a reference to Boris Berezovsky, a former Kremlin insider who lives in London and is one of Putin's fiercest critics. But investigators working on the case have not backed up Chaika's statement, which echoed statements made by Putin within days of the killing. 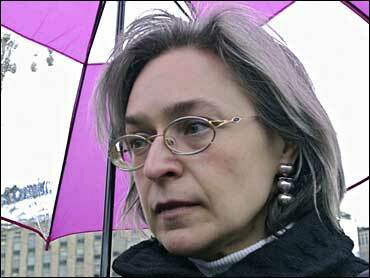 Garibyan said investigators believed Politkovskaya's murder was both politically motivated and linked to her writings. "If we speak about Anna's journalistic activities, we see politics," he said. "And when we speak about the political version, we can't avoid her professional activities because Anna was a journalist who wrote about acute political issues." The investigator said that some of the people questioned about Klebnikov's (seen at left) killing also figured in the investigation into Politkovskaya's murder. "The same people who were witnesses or contacts of witnesses and suspects in Klebnikov's case have come into the focus of our attention," Garibyan said. "But it's too early to talk about a clear connection between these two murders." Two Chechens were charged with carrying out the Klebnikov killing on behalf of a Chechen separatist figure, but were acquitted in 2006. The Supreme Court ordered them tried again, but the trial has been suspended since March after one of the defendants failed to show up in court. Several Chechens were also arrested in Politkovskaya's case, including the former chief administrator in one of Chechnya's districts, officials said. Many contested the official version of Klebnikov's killing, saying it was likely connected to his work investigating corruption and Russia's shadowy business world. Some observers, including Politkovskaya's editors, said she also might have been killed because of investigations into corruption that threatened to infringe on someone's business interests. Garibyan said the investigation has been hurt by leaks of information that occurred when his team had to share information with other agencies while preparing to detain the suspects and seize their car. He said that some of the leaks could have been caused by sloppiness, but others were deliberate. The suspects' arrests were announced in August by Chaika, who said Politkovskaya's murder was organized by a Chechen criminal group in Moscow that specialized in contract killings and that among the suspects were five law enforcement officers accused of tracking her and providing her killers with information. The names were printed in a newspaper the following day and included officers from the Federal Security Service and Interior Ministry. Novaya Gazeta editors, who have been working closely with Garibyan's team, said the leaking of the names hurt the investigation.